I have always found Elizabeth Tudor to be the most fascinating woman who ever lived. I remember being around 12 or 13 and seeing Glenda Jackson in Masterpiece Theater’s Elizabeth R. I was hooked. After that I read every single book on her I could get my hands on. I also have bought every VHS or DVD about her. Elizabeth was born in September 7th 1533, to surprise and disappointment as she was not the great son that Henry wished for. By the time she was a toddler, her mother was beheaded. She was lucky to have kind stepmothers as she grew, but she spent much time forgotten as Lady Elizabeth, going without proper clothing and goods. Her dearest mother figure was the great Kat Ashley, who helped raise her. When great King Henry died he left behind Katherine Parr, who had always been kind to Elizabeth. Katherine married Thomas Seymour, former brother in law of the late king and uncle to the current King Edward. Elizabeth went to live with them. Thomas flirted mercilessly with Elizabeth, who was just a child and quite besotted with him. He completely took advantage of her as a child. Some say things went too far, something Elizabeth would always deny. Eventually, things got out of hand and Elizabeth left in disgrace. Katherine, who had been pregnant, was delivered of a daughter, some say didn’t live, and regardless Katherine died. Thomas continued his reckless ways. He decided to kidnap King Edward, who was but a child, and crept into his room in the middle of the night. Edward’s dog barked, Thomas shot him and was promptly arrested. 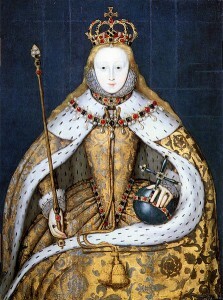 Elizabeth was then implicated in a plot to overthrow the king. With great tenacity and wisdom, Elizabeth was able to persevere through these accusations, despite her household staff sent to the tower. Thomas was eventually executed. Elizabeth spoke upon hearing the news (everyone hoped she would give her true feelings away) “This day died a man of much wit but very little judgment”. Thomas’ brother Edward, who was the Lord Protector, eventually was executed as well. With time, Edward became very ill. Suffering from small pox and tuberculosis (and who knows what else), he became weaker and weaker. John Dudley, now Lord Protector, sought to find a way to disbar both Mary Tudor and Elizabeth from the succession and, as the king was dying, replace them with Jane Grey a great niece of King Henry. Of course to make the situation nice, her had Jane forced into marrying his son Guilford. Poor King Edward died, still a child. Now Dudley would spring a trap for Mary and Elizabeth. Neither woman would fall for it. They were the daughters of Henry VIII after all. The plot was squashed and Mary rode into London triumphant to be queen. Both Elizabeth and Mary endured harsh childhoods, Mary more so. While Elizabeth grew and learned from these episodes, it seemed to have stunted Mary. Mary’s goal was to turn England back to Catholicism whatever the cost. And did it cost. An extremely unhappy marriage to Phillip of Spain, a man who was only “doing his duty” and treated her cruelly, phantom pregnancies financial hardships, the loss of Calais… Mary seemed to have very poor judgment into what the people wanted. Elizabeth spoke that she would put no windows in men’s souls and as a Protestant; she would tolerate differences in religion. Mary could not. “Heretics” burned constantly. She even imprisoned Elizabeth in the tower in yet another “plot” against the throne. That is just the first part of her story, I could go on for several pages. She was England’s greatest monarch. She proved a woman could rule and rule well, despite what people thought. She used her feminity and eligibility on the marriage market to sustain a country that had a tenious hold in the world and made it a superpower. She named an age, her country produced and supported Shakespeare. I can’t think of anyone who so just had “it” as she did. She was her father’s daughter and she was her mother’s daughter. She might have had the body of a “feeble” woman but she had the heart and stomach of a King!